Ageing populations, technological skills shortages, and macroeconomic uncertainties have exacerbated the need for companies to rethink their business and workforce strategies. Traditionally, in the midst of this sea of change, traditional jobs are being reconfigured and new skills are becoming critical to success, resulting in new requirements for the future workforce. 2. What size of workforce is needed? 3. What shape should it take? As technology becomes ever more modular and user friendly, and takes over transactional tasks, differentiated performance will be achieved through uniquely human skills. - Dynamism: Given the speed of innovation, companies need to target talent not only with the specific technical skills required, but also with the capacity for adaptability and curiosity; commercial acumen to identify innovative application opportunities; and the communication skills to tell a compelling story. - Customer devotion: Never before have customers been so well-informed and connected, leaving them with little tolerance for anything less than a stellar experience. With routine activities increasingly being automated, customers’ expectations are even higher when they need help with sophisticated and complex issues. By offering superior customer service — which requires an upgrade in capacity for problem-solving, personal accountability, and empathising — organisations can protect against product and service commoditisation. - Relationship-building: It will be critical to navigate less formal organisation structures, as will influencing skills and the ability to thrive amongst diversity as workforces extend beyond traditional internal boundaries and comprise talent across multiple generations. The digitisation of the enterprise is unlikely to deliver competitive advantage unless it is accompanied by a corresponding humanisation. The skills here are not new, but their rise in importance is notable. What used to be a ‘nice to have’ now becomes critical. Jobs that in the past could be delivered on the merit of technical excellence will no longer be relevant if the job holder does not possess these critical human skills. It may seem counterintuitive given technology’s pivotal role in everything we do today, but in many ways, technology elevates behaviours and attitudes over technical skills. According to the World Economic Forum, a widening skills gap is one of the biggest challenges in the fourth industrial revolution. In the future, work will be less about ‘using’ technology and more about ‘interacting’ with technology while applying cognitive problem-solving techniques. Our recent acquisition of a tech start-up Mettl, which uses cloud-technology to assess talent, is to help our clients maximise human potential by measuring personality, ability and job-specific skills. A robust mechanism to assess the workforce to identify the upskilling and reskilling needs will be quintessential for companies as they prepare for the future. In the case of DBS for example, it took the partnership development path when creating its digital skills training program. It partnered with Workforce Singapore to create an upskilling program designed to empower their employees for the ongoing digital transformation in the financial sector and to support the vision to make Singapore a Smart Financial Centre. The new platform delivered content through a wide variety of channels and learning partners, offline and online, including bite-sized e-learning, paid sabbaticals and scholarships. The platform also used AI to make personalized course recommendations to participants in the program. JD.com, the Chinese e-commerce giant is famous for using big data and artificial intelligence to expedite delivery and improve services. 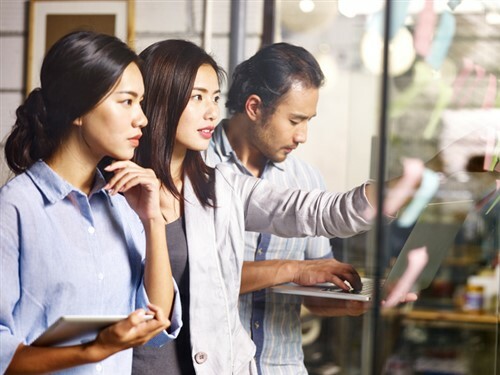 What is lesser known perhaps is how JD.com is applying the same data-driven decision-making in performance management of its more than 150,000 workforce. JD.com calls this the ‘Smart Talent Pool System’ wherein rich and nuanced employee personas are made possible rather than relying on traditional demographic segments to make people decisions. Ensure that workforce is continually upskilled and determine the necessary skills to remain competitive. Perhaps it’s equipping teams with digital skills or incorporating hackathons regularly so that they become part of the company culture. What is essential is that employees feel valued and that they have trust with the organization. Give employees chances to experiment and even to fail. The more technology and data is infused into the workplace, the greater the premium on contextual intelligence — a uniquely human skill. Workforce strategy when disruption is the new normal is more important than it ever has been. Puneet Swani is a Partner and Regional Business Leader for Mercer, a leading consulting firm in the areas of wealth, careers and health. This article is based on research found here.